Just when we might have seen just about everything now that both CES and MWC are behind us, some wonder at what we’ll be treated to during the events that unfold during CTIA late next month. 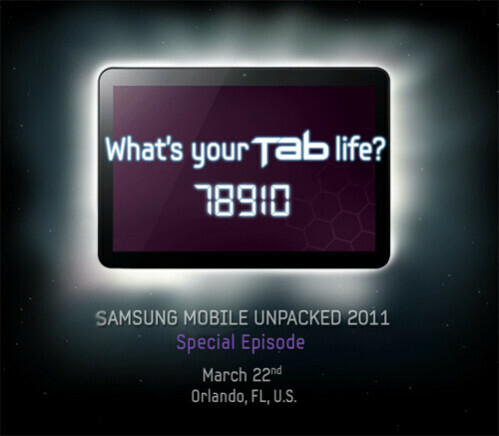 Well, it appears that tablets will once again be making its presence known as Samsung is giving us the slight indication that they will be unveiling their latest Android tablet. 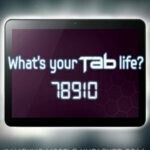 With the cryptic message of “78910” being displayed underneath a tablet that’s going to be flaunting Android 3.0 Honeycomb, it’s looking very promising that we’ll see them unveil their 8.9” Android tablet on March 22nd. Although we only see the faint outline of the device in question from the image, we also notice a front-facing camera on board with the tablet. However, that’s pretty much the only thing we can gather at this point from the image. Still, it makes sense that we’ll be seeing an 8.9” tablet – especially when it fits perfectly between their 7” and 10.1” Galaxy Tabs. Luckily, the wait won’t be long since we’re less than a month away from CTIA 2011! love the size a lot, 8.9".